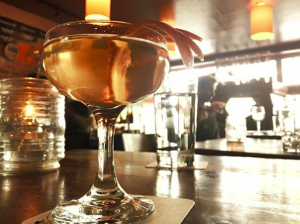 This drink is a twist on a Prohibition-era classic known as the Bee’s Knees, which is made with gin, lemon juice, and honey. Well, since we had the honey built in, we thought this was a natural! Combine ingredients in a cocktail shaker and shake with lots of ice. Strain into a cocktail glass. Garnish: Orange peel or a thin slice of lemon floated on top. 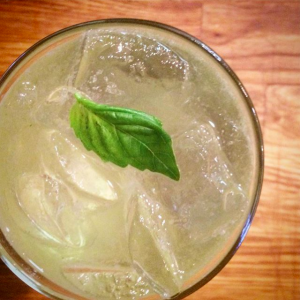 Variation: For the summeriest of summer drinks, muddle five leaves of basil into the mixture before adding ice and shaking. Strain over fresh ice in a large tumbler. Garnish with basil leaf. Combine ingredients in a Champagne flute or coupe glass. Since “vespers” are the morning prayers, Dalan chose to name this drink “Compline,” the evening prayers. Combine ingredients in a mixing glass with ice and stir. Strain into a cocktail glass. *If you don’t have these bitters (and, let’s be honest, most people don’t), most other fruit bitters work well. Just don’t use Angostura, but don’t leave out the bitters! Toddy #1 – A nice mellow sipper. Just limoncello, hot water, lemon, and bitters. Toddy #2 (The Seattle Toddy) – This all-Seattle version adds 2bar bourbon and Scrappy’s bitters into the mix. Toddy #3 – A little nerdier. For this one, we turn to gin and green Chartreuse for a nice herbal warmer. Toddy #4 – This one is a little bit toddy and a little bit tiki. Limoncello, rum, allspice dram, pineapple and lemon juice, and (optional) cubeb cocktail spice.